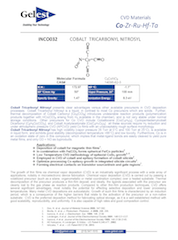 ZIRCONIUM t-BUTOXIDE | Gelest, Inc.
Reference: 1. Gould, B. et al. J. Mater. Chem. 1994, 4, 1815. 2. Aronoff, Y. et al. J. Am. Chem. Soc. 1997, 119, 259. 3. Teff, D. et al. Inorg. Chem. 1996, 35, 2981. 4. Ishitani, H. et al. J. Am. Chem. Soc. 2000, 122, 8180.